ALL THREE TRACTS SOLD PRIOR TO AUCTION! THANK YOU! Auction Date: Wednesday, May 22nd, 2019 @ 2 P.M if not sold prior to auction. DIRECTIONS: West of State Road 157. Please watch for signs on Defore road. This Real Estate is 24 acres on County Road 1275S and County Road 175E. 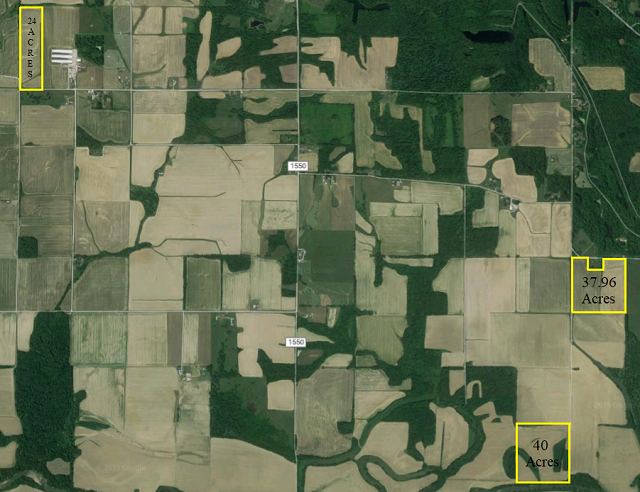 There are 23.97 tillable acres with 0.3 acres in CRP. There is Ava Silt (AvB2) soil. This Real Estate is 37.96 acres on the corner of Defore Road and Bethsedia Road. There are 37.44 tillable acres. There is Stendal Silt (StdAH) soil. This Real Estate is located on Bethsedia Road. There are 33.3 tillable acres. There is Stendal (StdAH) soil. Mineral Rights: An ALTA 2006 Title Insurance Commitment in the amount of the contract price will be supplied to the Buyer for the surface, if the Buyer desires a mineral search it will be at Buyers cost and will not delay the closing. Mineral Rights: All underlying minerals, coal, fireclay, gas and oil rights owned by Seller will go to the Buyer, if any and without any warranty.